I can't believe I am posting about another children's party. We just celebrated our baby daughter's 1st birthday at Vikings, then here I am, featuring our elder daughter's 6th birthday. As far as I can remember, hubby and I promised not to throw a big birthday party for Askim every year. When I say big, I mean it is something that we do outside our home, either in a fast-food restaurant or event place. But, as I look back, it appears that we partied each year and it seems unstoppable especially now that we already have two girls. Why is that? I think it's because both hubby and I can't help but celebrate every time they reach a milestone. It is how we show gratitude to the blessings of having two wonderful daughters. The venue was Cake City at Goldilock's Cake Plant along Shaw Blvd. We invited family, friends, and neighbors to have fun with us. A clown hosted the party. 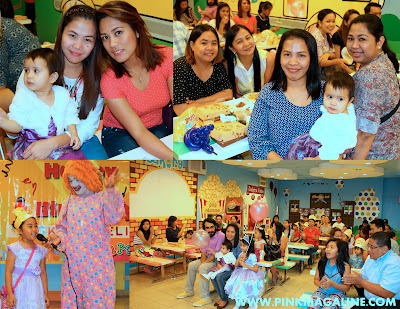 Here's the birthday girl, wearing a Princess Sofia costume, sitting beside an old friend and her daughter. 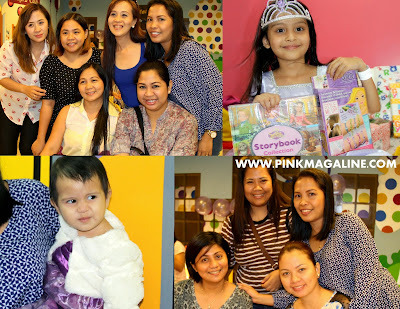 She's the one who picked Sofia the First for her birthday theme this year. The kids gathered to have a photo op with Goldilocks' cheerleader mascot. 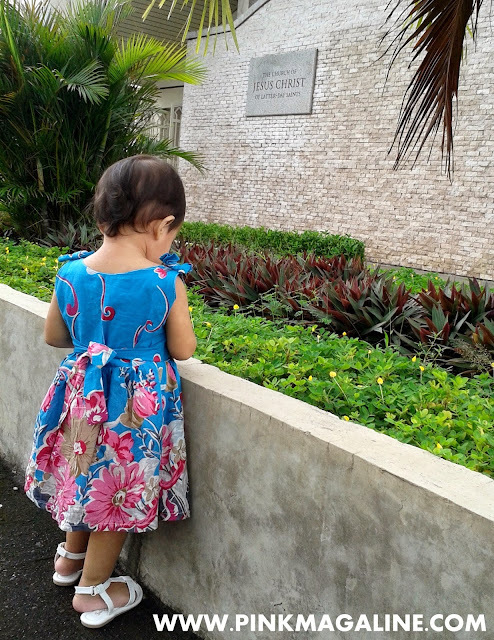 As you can see, my baby daughter is fascinated with her and aren't afraid of the sight of a mascot at all. This Goldilocks Sofia the First cake is so cute. I was supposed to order another fondant cake, but then again this is fine and an effortless pick for me. This is how it looks in full view. The flavor of this cake is chocolate with chocolate chips and chocolate ganache. Everything is edible except for the sticks that hold the heart-shaped sugar candies. Look at that happy kid. It doesn't matter now if we the food was a bit crappy or the clown wasn't really funny. Can't take it back anymore. For as long she loved her party. right? I didn't bother much on following the theme. I just made sure she got her Princess Sofia dress and her Sophia the First cake, then we all dressed in purple, that's all. Thanks to everyone who came to the party. Special thanks to all the mommies and daddies who dragged themselves just for their kids to participate. Hoping for a bigger and better party next year. 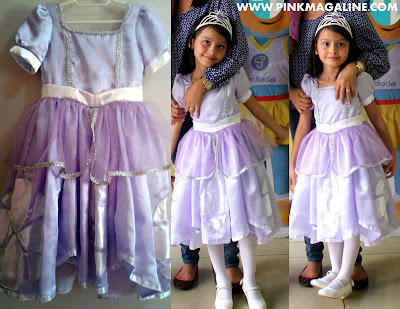 Lastly, the Sofia the First dress custom made by Fancy Ava paired with white tiara, white shoes and stockings. This is the same dress she's wearing to her Halloween party at school today. Askim is thinking to have Little Pony as her 7th birthday theme. I say not yet dear.. don't decide on a theme yet until at least 3 months before your birthday. Who knows there is a new movie or cartoon series coming, you'll really love it, and then think of it as your birthday theme. We'll wait and see. Till next year! My top 3 favorite cookies used to be French Baker's peanut butter cookie, Fibisco's peanut crunch, and Starbucks' white chocolate macadamia cookie. The thing is, there is always one reason that I also don't like in each of these cookies I mentioned. For example, Fibisco's cookie is too crunchy. It's hard to eat it alone. I would normally dip it in fresh milk to soften. On the other hand, French Baker and Starbucks are both a bit pricey. Plus, I don't like the white chocolate in Starbucks' cookie. I never like white chocolate. I wish they use only macadamia in it. Well obviously, I don't have my top 3 favorite cookies anymore that's why I said "use to be", right? What I have right now is a recipe of a chewy peanut butter cookies that I like so much. I searched the world wide web, collecting the necessary ingredients, gathering some tips, in order to create this recipe. I've been using this for how many times already before posting it here. Hubby likes it so I am confident that it is perfect. Check this out. So yummy and chewy. Not too sweet and just right in the palate. I could eat this everyday for breakfast or midnight snack. -Beat sugar and butter until creamy. -Add peanut butter, vanilla and egg. Mix well. -In a separate container, combine flour, baking soda, baking powder and salt. -Gradually add the flour mixture to the butter mixture. Mix well using hands. -Wrap the dough in plastic and refrigerate for at least 1 hour. -Divide the dough and form into 1 and a half inch balls. -Flatten each balls using fork in a crisscross pattern in a lined baking tin. Yield: Makes about 32 cookies in regular size. I don't have peanuts in my pantry these days, but planning to buy on my next trip to the grocery. In case you like your cookies a bit chunky, you can always add about 1/2 cup of roasted peanuts in it. Cheers! I had this blue floral fabric in my stash of leftover and unused sewing materials waiting in my closet. When I bought my Brother JS-1410, I knew I will be creating something cute out of it, either a dress or a skirt for one of my daughters. 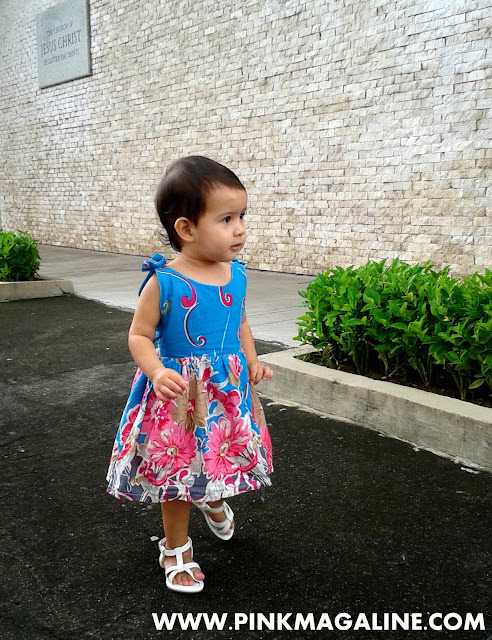 Finally, I was able to squeeze a little time between cooking, breastfeeding, and other household chores and finished this summer dress for Suna. Actually, I shared an image of this dress in my IG account HERE. If you look at it closely, you'll notice the imperfections at the shoulder area and its arm hole. I corrected my mistake by reducing the length and adding snap fasteners on the right shoulder. She's pretty and comfy in her new dress made by Mama. Here's the view of the back with a ribbon. I'm happy that I was able to use this fabric and found a remedy to negative result of my experimentation. Hahaha. I don't have proper training when it comes to dressmaking. I know I need more practice and orientation in pattern-making, cutting, and sewing. As for the design, I have a queue of ideas like I'm planning to sew a Halloween costume, a lace dress, party dress, etc. Who knows Zoobic Safari and Zoocobia are the same? Yes, they are different yet pretty much the same, or the latter is just a miniature of the first, whatever. It got me confused just by the name. It never came to me that it could be just one company or establishment. I thought Zoobic Safari has nothing to do with Zoocobia. I was wrong. Zoocobia is located in Clark while Zoobic Safari is in Subic. However, according to our tour guide in Clark, they are sister companies, owned by the same people, thus sounds similar and looks familiar which each other. In September, we revisited Zoobic after 4 years that we first went there, and then, we made a pit stop at Zoocobia on the way home. I wish we didn't. I mean, visiting 2 zoos in one weekend, 'cause it was tiring, but it happened and the kids enjoyed anyway. Our small family. In stripes. The girls were dressed as twins, obviously. It rained that day. Glad this camel cheered us up. And there was this kind of traffic that you never see in the city. The petting zoo is what we liked the most at Zoocobia. We did it all for this girl in her birthday month. She was scared that her hands could be bitten by goats. Haha. But, she was able to ride a horse despite the heat of the midday sun. Bravo little miss! I think it will take a few years again before we could go back to Subic. It is not easy to reach that place. The amount of motorist northbound is a lot. I'm sure it will take another 3 to 5 years before we could revisit. Clark is quite near, though, and just a bit ahead of Bulacan. We found a nice place to stay called Prism Hotel and the kids love swimming at Fontana Leisure Parks, so we'll probably go there, if not before the year ends, maybe early summer next year.